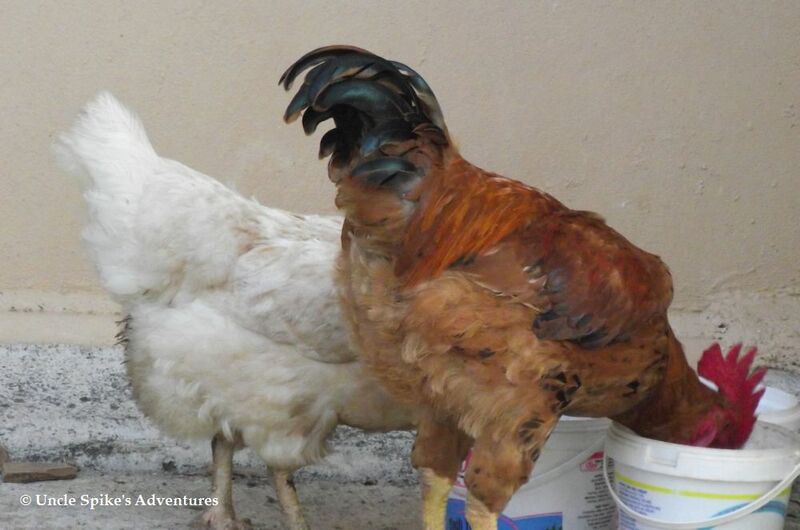 Follow the regular guest spot from Uncle Spike’s Farm in Turkey! Here is the latest… (episode 10) Press logo for catch-up or just read on! Hey Aunty Gill – yep, I’m still here! Biggest news round these parts was old Mary (well, she’s old to me; at least by 9 months, I’m sure of it), decided to become a mom. She started to not come in at night, and Farmer Spike kept finding her sat in the nesting box, but never any eggs there. “Ah, this ones’ gone all broody, looks like”, he said to nobody in particular one evening. So anyway, the next day, I saw Mary was behind bars. Well, at least that’s what I’d thought. Actually, Farmer Spike had prepared a nesting box all of her own, and added eleven eggs to it. He’d then caught up with Mary and stuck her back under the stairs, with this box, and then closed the gate to ‘encourage’ her to sit on the eggs; which she did. Trouble was, old Mary, who isn’t that old, has never had kids, and was pretty lame at the sitting lark. She would sit for hours alright, but kept on breaking the darned eggs. However…. phooey, what a stink!! I reckoned it was my cooking, but he’s not into curry much, so I guess it was the eggs after all. After just fifteen of the required twenty days sitting, the place stunk…. And she had ALMOST NO EGGS LEFT; all had been broken, bar one, and Farmer Spike removed that (very carefully too I might add!) – he said that rotten eggs were very ‘light’, hence he ‘knew’ that last one was no good either. He carried it off slowly, and lobbed it over the fence into the deep ditch…. BANG (he was right – another phooey smell over there too). She was right. Farmer Spike was grumpy, having ‘wasted 11 eggs’ at a time when the girls maybe lay one between them each day (they like a holiday in the summer). Farmer Spike says maybe old Mary was just no good at being a mom, but then he suggested another, yet more sinister accusation…. Was the rooster (aka, ME) just firing ‘blanks’? Not sure what that means yet Aunty Gill, but he said for my first ‘review’, my future as Rooster wasn’t looking good. Oops. Oh dear Brian! Love the singing photo of you and what a lovely photo of your gorgeous feathery bottom! But you and Mary sound like a couple of feather brains to me!Perhaps you had both better put in some study time about making babies. Read the manual these darker nights! I hope things improve soon. It sounds serious to me…. Brian is going to have to prove himself if he plans to rule the roost…poor boy. Life is harsh! He has a big job ahead! Indeed… He’s a good lad to have around, but being ‘unsure’ if eggs are even fertile makes it pretty useless for any broody hens we have. Hmm, what to do? call in Dr. Pol…let him take a look-see. We are on another register here ,Guill . Do you know the musical piece ” Poet and Peasant – Overture” by Franz von Suppé ? Michel always knows what to do…if this fails, there is always “Bolero”. 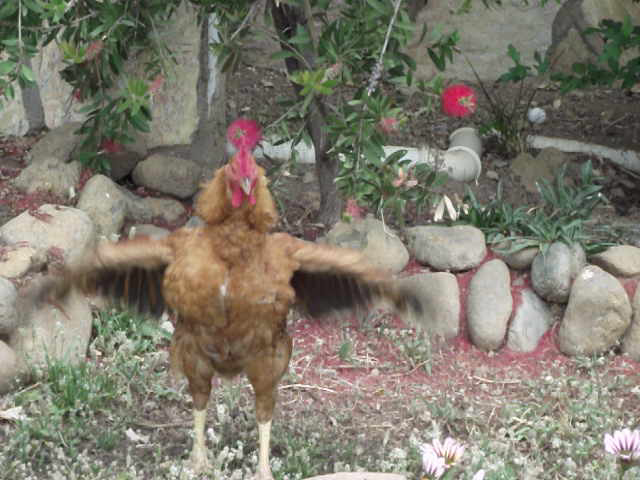 Here it is, Brian (the rooster)’s latest letter to his Aunty Gill; part of a year-long series of guest posts from Uncle Spike and the roosters. Hummmm, blanks. Whatever in the world is that?